SAN DIEGO — Two new studies focusing on San Diego Bay’s 2,200-slip Shelter Island Yacht Basin show decreasing levels of dissolved copper in the water, compared to previous studies — and they find levels that are not toxic to most of the area’s marine life. The news from the two studies completed in March brought both a sigh of relief to area boaters and a signal of caution about current moves the Port of San Diego is making to reduce the amount of dissolved copper in Shelter Island Yacht Basin. 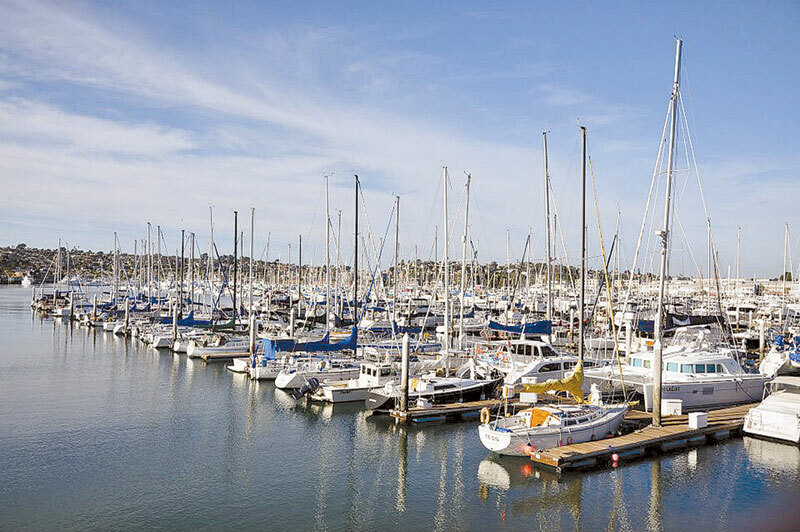 The situation boaters in one of San Diego’s largest recreational marinas find themselves in today began when water testing found elevated levels of dissolved copper in many harbors in California. In 1996, the San Diego Regional Water Quality Control Board determined that 95 percent of the copper found off Shelter Island came from the sloughing of copper-based boat bottom paints in the basin. Copper, a common ingredient in antifouling boat paint, was said to be toxic to marine life in the surrounding area. The water quality board issued a Total Maximum Daily Load (TMDL) for Shelter Island Yacht Basin, meaning limits had been placed on the amount of dissolved copper allowed in the basin at any given time. Since then, the Port of San Diego has been working to minimize the amount of dissolved copper in the waterway by implementing Best Management Practices for hull cleaning companies, focusing on reducing the amount of copper released into the water and grant programs to give boaters incentives to replace their copper-based hull paints with non-biocide hull paints. The TMDL order from the regional water board stated that there must be a reduction in the amount of dissolved copper in Shelter Island Yacht Basin of 10 percent by the end of 2012, 40 percent by 2017 and 74 percent by 2022. The first study was prepared by Weston Solutions and the Port of San Diego for the Regional Water Quality Control Board as part of the first progress report, to determine whether the basin was coming closer to meeting the 10 percent reduction rate required by the end of this year. The findings showed a 27 percent reduction in annual dissolved copper loading from boats in Shelter Island Yacht Basin and a 15 percent reduction in the annual dissolved copper concentrations in the basin, surpassing the 10 percent milestone that the basin was required to meet by the end of next year. The news is positive for the Port of San Diego, which is looking to avoid further orders from the water quality board. However, Cleve Hardaker, president of the boating advocacy group Recreational Boaters of California (RBOC), said that the findings are concerning for boaters, because the report states the primary reason for lower copper levels is reduced slip occupancy in the basin. The report also stated that vessels converting to non-copper or low-copper bottom paints aided in the reduced copper loading levels in the basin. According to the report, 272 vessels in with slips in the basin converted to either low-copper or non-copper bottom paint, resulting in an 8.7 percent reduction in copper loading in the basin. In addition to the improving copper loading numbers that appear to be meeting the mandated 2012 levels, the average dissolved copper concentration in the basin has decreased, as well. A 15 percent reduction in the average dissolved copper concentration was measured in 2011 surveys (7.01 micrograms per liter) from the baseline average dissolved copper concentration (8.28 micrograms per liter). Despite the improvement, the dissolved copper concentration is still nearly three times higher than the water board’s allowable copper level standard of 3.1 micrograms per liter. “The study showed that the copper levels in the basin are still exceeding the water quality objective, but we’re seeing evidence that copper loading and water quality are improving,” said Karen Holman, environmental specialist for the Port of San Diego. Questions have been raised about the 3.1 micrograms per liter threshold, which was implemented for Shelter Island in accordance with the California Toxics Rule — a federal water quality criteria under which even extremely low concentrations of copper are determined to be toxic to marine life in the affected area. But the Weston Solutions report — and a second report financed by the U.S. Department of Defense — found that the toxicity level in the basin might not be as high as once thought. According to the Weston report, although water toxicity levels exceeded the 3.1 micrograms per liter level at all six of the testing stations, evidence of toxicity to marine life was only found at one of the stations. In the Department of Defense’s SPAWAR study, in coordination with the University of San Diego, the findings of a potential disconnect between the water quality order and actual toxicity levels were even more apparent. Samples were collected at 15 locations throughout Shelter Island Yacht Basin at two different depths, with tests conducted in March and July 2011. The results found elevated levels of dissolved copper in Shelter Island Yacht Basin in comparison to San Diego Bay, but the elevated levels did not affect toxicity levels for marine life. The study focused on mussel embryos — one of the organisms at risk to elevated copper levels — and showed that only at one of the 62 testing sites was the water deemed “somewhat toxic.” In addition, samples with dissolved copper levels as high as 8.8 micrograms per liter were deemed not toxic to mussel embryos. Hardaker hopes the new studies show the Regional Water Quality Control Board that the current water quality order placed on Shelter Island is unnecessary, as toxicity levels appear to be far less than expected. He pointed out at a February RBOC forum at Dana Point that a similar copper TMDL was ordered in San Francisco Bay, but it was removed when further testing showed that high copper levels did not have an adverse effect on marine life in the bay. “Admittedly, the argument is made that there is excess copper in a lot of the harbors in Southern California, but there is no copper (toxicity) problem whatsoever in San Francisco Bay,” Hardaker said. Despite the findings of the new reports, Haas indicated that the Regional Water Quality Board does not plan to remove Shelter Island Yacht Basin from its list of impaired water bodies in California. “The (SPAWAR) study itself provides decent information about the basin but insufficient evidence to remove it from the impaired water body list — partly because the board’s decisions are based on all available evidence, and partly because the study does not seem to be designed to address the questions that could lead to delisting,” Haas said. He added that a number of studies from the 1980s, 1990s and 2000s have linked elevated dissolved copper levels in Shelter Island Yacht Basin to adverse effects on the area’s biota, such as toxicity, decreased species diversity and an absence of copper-sensitive species. In Sacramento, work on Sen. Christine Kehoe’s Senate Bill 623 — aimed at banning copper-based bottom paint use for recreational boats in California — continues with an eye on Shelter Island. Currently, the bill sits in the Senate Appropriations Committee, having passed the Senate and Assembly Policy Committee. It is expected to be heard in June, but not before a revised version of the bill has been drafted. Barr said the original draft included a statewide ban on copper bottom paints — but after working with boat paint manufacturers, the bill will be aimed at including low-leach copper bottom paints on the approved list. “As long as the Port of San Diego has to comply with the water board’s TMDL to reduce copper loading by 2022, the port is stuck and the bill is still needed,” Barr said.